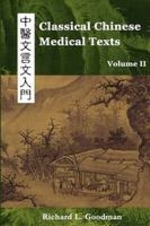 This series of books represents the first introduction to classical Chinese that focuses solely on medical texts. The selections that make up the chapters span a period of nearly 2,000 years, covering the entire written history of Chinese medicine. The extensive vocabulary lists, detailed grammar notes, example sentences, and clear explanations make this series suitable for self-taught learners and classrooms alike. Each chapter contains the text in its original as well as modern written forms, a vocabulary section, pinyin, translation of the texts, and a detailed notes section which explains grammar and difficult sentences. For reference, there is also a simplified version of all of the texts, a complete index and glossary, and detailed suggestions for how to successfully use the books. Volume II contains fifteen selections broken into five major classical themes, including texts on the concept of the superior physician, madness, evil, and spirit. Nine of the fifteen selections come from the Huang Di Nei Jing Ling Shu with the remainder coming from the Nan Jing, Jin Gui Yao Lue, and other sources never before available in English.